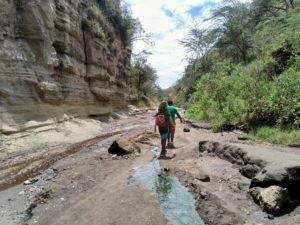 Went out of town last week for some camping and to explore some National parks about an hour outside of Nairobi – Hells Gate and Mt Longonot. I had been to Longonot and Hells Gate on school trips before. I really enjoyed those trips so I was eager to get back and explore them a bit more. Check out the first part of the adventure below, I will release the second part next week so keep an eye out for that. Driving up was pretty chill and we got to check out some spots I’ve had my eye on. The first I had been to before, but the second I had never, Unfortunately, the second was chip sealed. This was so gaddamn sad as that road was pretty much perfect – It was out of the way, had a variety of corners and was kinda steep. Perfect for loads of runs and for skating the entire day, but alas. There wasn’t much else in the way of skate spots in those areas, so that was pretty much done and dusted. We camped at Fishermans camp. It was kinda expensive and for the same cost, we could have gotten a REALLY good Airbnb with proper beds etc. etc. So I would not recommend unless you had your own tent and are into the whole camping experience. That said, it had really nice showers, a nice bar, a restaurant and had activities you could on it. Anyway. The second day we got to explore Hells Gate. It’s a national park where all the animals are pretty much used to people and you can cycle and walk about. There are Buffalos, Zebras, Leopards, Warthogs, Impala etc… With cycling, you’re pretty much limited to the track, but if you walk you can go off and explore a bit more. I want to go back and do that because the cliffs seemed interesting, and I would probably get to see more wildlife that way. There are also a bunch of other activities like rock climbing and swimming in a geothermal pool that you can do. You can find a full list on the Hells Gate website. The road/track extends 8km down to a gorge that’s been carved out by a river over a really long time. The gorge itself is pretty interesting and a bit of a challenge (for some) to get down to. It has its own trails and interesting points, I would highly recommend setting aside a few hours to go and fully explore it. You need a guide to explore it – it costs 2000ksh (about $20). They don’t tell you that on the website so we were surprised to learn that when we got there. Mt Longonot is basically this 2km tall ‘mountain’ that you can climb and descend in a day. It’s 3km from the gate and it gets more challenging the closer you get to the crater. There are some steep parts and mellow parts, and parts that will have you clutching your chest as you struggle to breathe. It’s quite dusty and hot, so I recommend you carry some water, (sunscreen for ye pale folk), wear a hat and be prepared to look like you’ve been playing in the dirt. At the top, you get to the Crater only to find there is more hiking … Optional hiking that is. Apparently, there are Buffalo on the Mountain so it is recommended you go with a guide in case you run into one. Kenya is really interesting and has a lot to offer. I really need to get out more and go on more hiking excursions. Its something I’ve enjoyed in the past and should really invest more time in it, after all, Kenya does have a lot to offer in that regard.